BUENOS AIRES - DEC 9: Puerto Madero harbor and the landmark Puente de la Mujer footbridge at night on December 9, 2011 in Buenos Aires, Argentina. Photo time-lapse with wide angle. 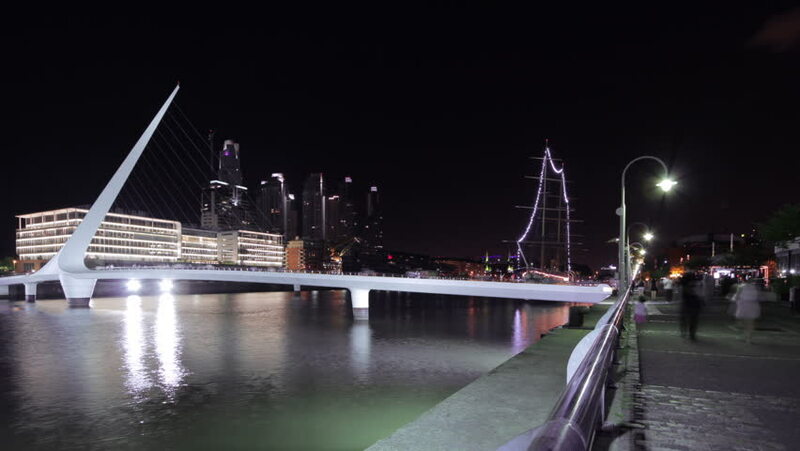 hd00:21Puerto Madero harbor, Buenos Aires, with the landmark footbridge Puente de la Mujer, the museum-ship Fragata Sarmiento, several old harbor cranes and skyscrapers of the city center (Can. 7D). 4k00:05hong kong - october 2014: night light international finance center 4k time lapse from hong kong, china.